After churning out the incredible marvels of technology like interactive eyewears, autopilot cars and whatnot, Google is now going to manufacture world’s first electronic textile, aka E-textile. At a developer’s conference held in May, Google unveiled its new, ground-breaking technological wonder, The Project Jacquard which was named after the 19th century loom. The project’s core innovation revolves around its “conductive yarn” that is so strong and robust that it can be woven on any industrial loom. The amazing thing about the jacquard yarn is that it is totally indistinguishable in that it can blend perfectly well with any synthetic and natural fiber say silk, cotton and polyester that it’d look like “just a normal yarn”, says the textile development and project lead, Shiho Fukuhara in an introductory video. A thin metallic alloy will be at the core of clothe around which the regular fiber would be braided. The thread will be connected to the chip – with a size of a button – that would react to touch and gesture interactivity. With the gesture control, one can monitor heart-rate, interactive with a mobile app, and do whole lot of other cool things. Designers and developers will be able to create customized gestures and touch interactivity using the conductive yarn. 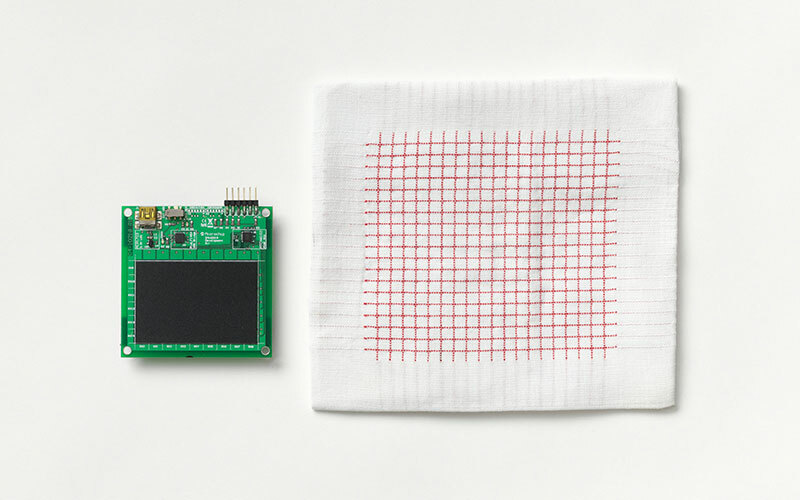 Moreover, sensor grids will be placed throughout the fabric to create a large interactive surface so that user can interact with the technology from anywhere on the fabric. When the users interact with the fabric, data would wirelessly be transmitted to their connected device, be it their smartphones, laptops, tablets, or any other smart gadget for that matter. Ultimately, the gesture interactivity on the e-textiles will be used to easily access the functions of any device and use however the way the use would want for instance listening to songs, answering calls, skimming contact’s list, or any other cool feature designers will come up with when the technology is out in the market ready for mass-scaling.